As an alternative to a diet based on the excessive intake of animal based protein and carbohydrates from refined products, vegetarianism is starting to become more popular in Málaga. In recent years, vegetarianism has become more important in the capital and you can sense this when you look around at what is on offer: from the classic “Cañadú” and “El vegetariano de la Alcazabilla”, other vegetarian restaurants have opened, such as “El Calafate” and “El Huerto”. We went into the kitchen of the latter to talk to Jon Eguiguren, in charge of the restaurant since its opening in December 2008. With a comfortable, inviting and friendly atmosphere, “El Huerto” attracts both vegetarian and non-vegetarian customers, mainly due to its set menu, made with fresh and seasonal products. For 8.50€ customers can enjoy three different courses and a dessert, chosen from the menu which is updated every day. To see the latest offerings their web site is updated daily – www.restaurante-elhuerto.es. Their most popular dishes include the classic gazpacho and ajoblanco, the El Huerto quiche, the farmer’s cheese cake and the couscous, which is served every Saturday. Moreover, this family restaurant, run by two Basque brothers with help from their parents, also offers some dishes which do not include eggs or dairy products and, therefore, are suitable for vegans. These dishes are indicated with the letter (V) and, with a (C), those dishes which are gluten free, suitable for people who are intolerant. The set menu is also available to take away, so now there are no more excuses not to eat a complete, delicious and healthy meal without stepping foot in the kitchen. Jon explained that he decided to open the restaurant even though he hadn’t any previous experience with vegetarian cuisine. After one and a half years running the business, he is happy with people’s response. They have regular customers who choose the vegetarian set menu as an alternative to the classic set menu offered by other restaurants in the city centre. And this patronage is rewarded in “El Huerto”, as every time you eat there you get a stamp, and with seven stamps, the next time the meal is completely free. The restaurant is open for lunch from Monday to Saturday, and on Friday and Saturday they are also open in the evening, offering a wide range of à la carte dishes. If your mouth is already watering, don’t wait any longer, get down to “El Huerto”, centrally located in c/ Dos Aceras, 18, between c/ Carretería and c/ Álamos. If you would like to keep up to date with all the news from “El Huerto” visit their website (ww.restaurante-elhuerto.es) or follow them on facebook joining their group “Restaurante Vegetariano El Huerto”. -Separate the mushroom stems. Place the caps in an oven tray and bake them for 20 minutes on a low heat. -Chop two of the onions with all the carrots and courgettes into fairly small cubes and fry them lightly. -In a small pan, fry the remaining onions and the mushroom stems lightly. Add a little bit of water and let boil. Blend and, if necessary, add more water to get the desired consistency of a sauce that you like. 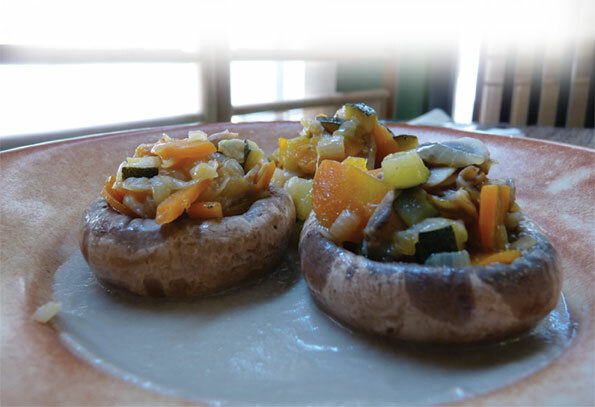 -Pour the sauce on to the plates and, place the mushrooms on top and fill with the cooked vegetables. Easy to prepare, this dish is light (there is no cream and almost no oil), cheap and delicious. This entry was posted in Healthy Living and tagged organic food, vegetarian. Bookmark the permalink.